It's a big world we live in. Perhaps that's why there's a craze right now to downsize our vehicles. Take SUVs for example, these once behemoths are now called crossovers and some are smaller in overall weight and size than some sedans. 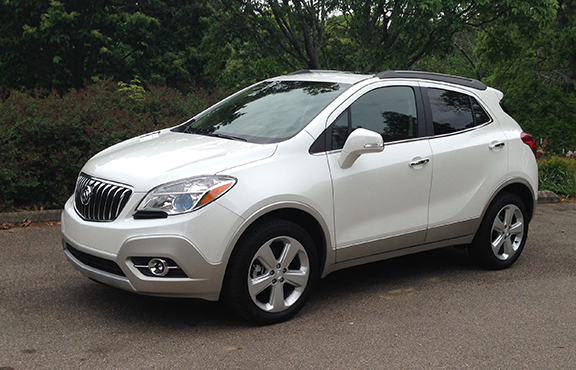 That's why the 2015 Buick Encore seems to fit right in, literally and figuratively. This diminutive crossover is small. And it also fills a gap in the consumer demand for smaller vehicles that aren't cars, but that ride like them. Of course Buick takes things further offering this small crossover with 4G LTE built-in WIFI and also offering one of the quietest vehicles on the road. This Encore has only a few changes for this model year, but is nevertheless worthy of its name, as it's quite ready to take an Encore and make another curtain call in the ever-expanding small crossover segment. When can an SUV be categorized as petite? When it has dimensions smaller than most family sedans on the road. The Encore's tiny size is part of the vehicle's overall charm. It embraces its small stature which is rare for the Buick brand of the past. 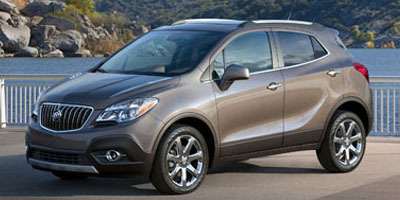 But the Encore is certainly a sign that Buick is paying attention to customer demand by offering such a small vehicle. The bulbous styling of the Encore is quirky, but not as quirky as something like the Nissan Juke or Kia Soul. It still has distinction, and certainly stands out from other members of the Buick family. Due to the angled A-pillar of the Encore, driver views are obstructed with a nasty blind spot just to the front, left of the driver's side. The Encore is nearly as wide as it is tall giving it a more circular appearance. With modern design flares, the Encore shakes off Buick's reputation as being for an older demographic. Indeed, the overall aesthetic appearance of the Encore is one aimed at a younger buyer, although empty nesters will also appreciate its tiny posture. 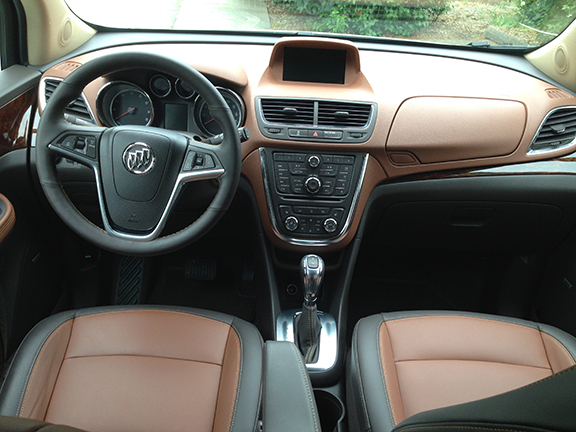 We've always appreciated the "move up" luxury of Buicks. Sure they have the stigma of being considered an "old person" vehicle, but that stigma is really not fair. Most of today's Buicks are modern and chock full of technology. That's certainly the case with the Encore. Plus, it has all the niceties you expect from the Buick brand. The seats are clad in leather. The front row is quite comfortable and even legroom and shoulder room is ample. This is not so much the case in the back seat where leg room is at a premium and headroom can be a little cramped for taller passengers. However, the back seat isn't that cramped, considering the tiny dimensions of the Encore. Keep your travel companions to only two and everyone should be happy. Fitting a third passenger in the back is a recipe for unhappiness. Buick partners with Bose to create one of the quietest rides on the road, and certainly the quietest in the segment. Using noise cancellation technology and Buick's Quiet Tuning technology, the interior of the Encore is whisper quiet with little to no outside noise intrusion. Cargo space for the diminutive Encore is minimal. With seats up, there is 18.8 cubic feet of space, which is much less than even many sedans. Fortunately, the second row seats can be folded completely flat which expands the cargo area to 48.4 cubic feet. As mentioned, the Encore is chock full of nice technology. First starters, GM adds their 4G LTE WIFI to the Encore for this model year. GM has been touting this mobile WIFI hotspot as a major selling point in their advertisements. It's quite easy to connect phones or devices to the WIFI and surely the smaller passengers will appreciate this convenience for longer road trips. 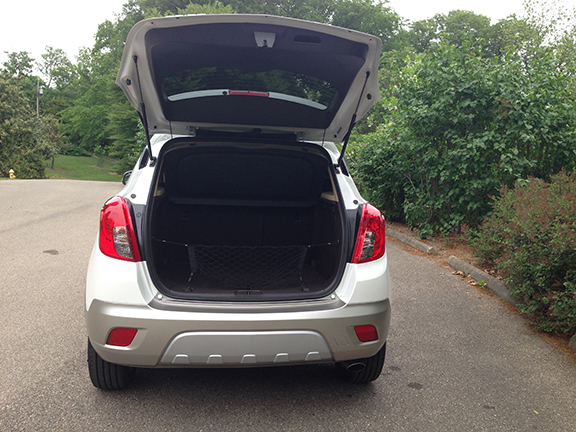 We've already addressed the quiet tuning/active noise control technology that is used inside the Encore. But it warrants another mention here. Te system, while independent from the sound system, is one of those technologies that goes unnoticed, but that's exactly the point. The infotainment system is easy to use. The voice-activated Buick Intellink integrates with the infotainment system, allowing for easy-to-use voice commands, and hands-free (safe) driving. The color touchscreen is attractive and well organized and the overall system is quite intuitive. Again, this certainly isn't grandpa's Buick with all the technology found in the affordable Encore. For a vehicle that weighs under 3,300 pounds you'd expect fantastic fuel economy. And the Encore does deliver that. FWD models have an EPA rating of 25 mpg/city and 33 mpg/hwy. We drove the all-wheel drive Encore and it had just slightly decreased fuel economy. AWD Encores have an EPA rating of 23 city and 30 hwy. Because of the paltry horsepower, the Encore is best suited for the city and suburban roads. In a week's worth of driving, mostly off the highway, we averaged an impressive 28 mpg. There are several available safety features that are standard for all trims of the Encore including side blind zone alert, rear cross traffic alert, lane-departure warning, forward collision alert and front/rear park assist. There are 10 standard air bags and a rear-vision camera. 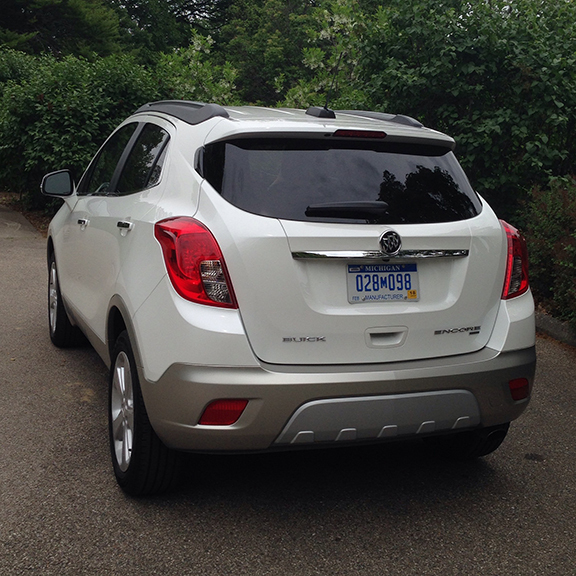 GM's Stabilitrak stability control system is used in the Encore with full function traction control. There are four-wheel disc brakes with ABS and electronic brake distribution which gives unbelievable control and adds to the overall drive performance, as well as the safety. There's little excitement when it comes to the overall drive experience of the Encore. The small engine is sluggish. A 1.4-liter turbocharged Ecotec engine makes only 138 horsepower. Even the addition of the turbocharger can't redeem the ho hum performance of the Encore. The under powered Encore has a six-speed automatic transmission that really feels outdated. Shifts can be slow and there is turbo lag in some of the gears. The Encore is a superb handling vehicle. Its small stature is conducive to agile on-the-road driving and it doesn't disappoint in that regard. The turning radius is one of the best we've experienced, certainly within the segment. Maneuverability is tremendous and further aided by the optional all-wheel drive. For those who live in the city or the suburbs where parking is tight, the Encore is a great option. You have to sacrifice power and accept the flaws of the punky engine, but what it lacks in driving excitement it makes up for handling and maneuvering. The base trim Encore starts at $24,065. This is a competitive price within the segment, rivaling the newest competitor to the segment, the Honda HRV. 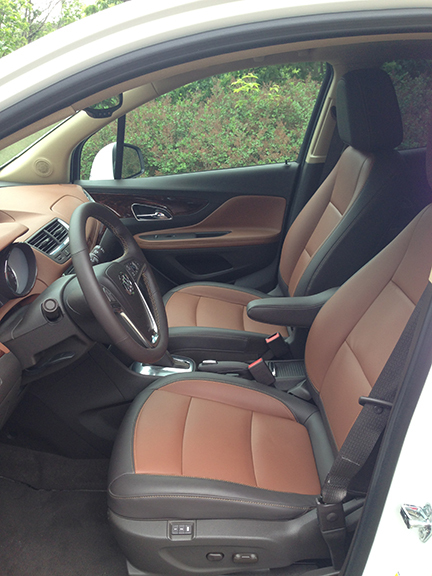 There are four trims levels for the Encore including the base, convenience, leather and premium. Our tester was the leather trim which in addition to leather seats and steering wheel (what else would a Leather Trim have? ), included a heated steering wheel, remote vehicle starts and a cargo net for behind the seat storage. MSRP for the Leather Trim starts at $29,450 while our tester had other extras like a moon roof and an advanced audio system that took the final price to $33,620. Buick has to be cautious not to price the higher end (and more desirable) Encores out of the segment. They should concentrate on keeping the sticker below $30,000 to stay competitive in the ever-growing segment. The American consumer is downsizing, at least within the auto segment. Their vehicles are getting smaller and smaller, and that's where the Encore thrives. This micro crossover is targeting that specific buyer that wants smaller vehicles that are still technically SUVs. However, keep in mind that the Encore is smaller than something the size of a Toyota Camry. The Encore is only 168.4 inches long and has a wheelbase of 100.6 inches. In comparison, the Camry is 190.9 inches long with a wheelbase of 109.3 inches. The Encore weighs a petite 3,237 pounds. Some critics have called the Encore a bubble on wheels due to the height and width being so similar in dimensions. And while this gives the Encore a distinctive appearance, it also makes for one maneuverable urban vehicle. As a vehicle that wears the Buick badge prominently on the attractive grille, the Encore is certainly not your grandparents Buick. It's youthful appearance and tiny build is indicative of high consumer demand and shows that the Buick brand is in a revival period with a major influx of modern flare and appeal. 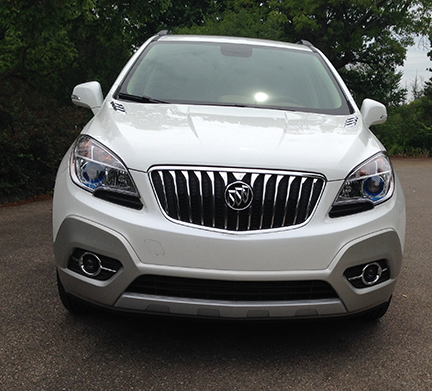 Interested to see how the 2015 Buick Encore ranks against similar cars in terms of key attributes? Here are the 2015 Buick Encore rankings for MPG, horsepower, torque, leg room, head room, shoulder room, hip room and so forth.